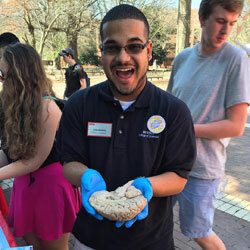 As early as the summer after 9th grade, Brooks began shadowing researchers at Duke University and NC State through Labs for Learning and CAALS 3-D – the North Carolina School of Science and Mathematics’ (NCSSM) outreach programs. Conducting independent research as a senior at NCSSM afforded Brooks further insight into how bench research broadens society’s understanding of medicine and human health. 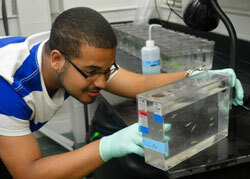 Brooks began his NC State career in the Life Sciences First Year program. Initially, he contemplated a biochemistry major in preparation for pharmacy school; however, after learning more about the various degree programs and seeking advice from Park alumnus Ian Hill ‘13, Brooks declared a major in biological sciences with a concentration in molecular, cellular, and developmental biology. He credits Dr. Nanette Nascone-Yoder, one of his three Park Faculty Mentors, with introducing him to the field of developmental biology. During one of their first conversations, Nascone-Yoder spoke with Brooks about intestinal malrotation, which occurs in one in 500 human births and can result in life-threatening complications in babies and children. When scouting out enrichment opportunities for the summer following his freshman year, Brooks happened upon The Leadership Alliance, a national program led by NC State alumna Dr. Medeva Ghee that provides mentored summer research opportunities at 22 different institutions to students who are typically underrepresented in science, engineering, social sciences, and humanities research careers. He applied and was matched with the 10-week Building Diversity in the Biomedical Sciences program at the Tufts University Sackler School of Graduate Biomedical Sciences in Boston. 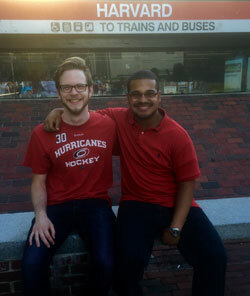 In addition to working 40 hours per week in a lab, investigating tissue mineralization defects in the fin rays of zebrafish as models for developmental deformity diseases of the human skeleton, Brooks took advantage of the opportunity to explore the city of Boston – and even met up with Ian Hill. He attended seminars about oral and written scientific communication, graduate and professional school application processes, and ethics in biomedical research. While in Stamford, Brooks learned about the Annual Biomedical Research Conference for Minority Students (ABRCMS), one of the largest professional conferences for underrepresented minority students in STEM. He applied to attend, and was selected to receive a grant that covered the conference registration fee and all associated travel costs. At ABRCMS 2015 in Seattle, Brooks presented his summer zebrafish research and networked with faculty from a number of universities with strong developmental biology graduate programs. Among the individuals with whom Brooks connected at ABRCMS was Dr. Ida Chow, executive director of the Society for Developmental Biology and its Choose Development! Fellowship program. With encouragement from Nascone-Yoder, Brooks applied for the fellowship and was recently selected as a recipient. This funding will allow him to work in Nascone-Yoder’s lab, investigating the molecular and cellular mechanisms of cardiac left-right asymmetry. Further guiding his future plans is Brooks’ desire to inspire the next generation of great scientific minds. During the Park Class of 2018 Learning Lab I, Brooks and his classmates spoke with leaders about the socioeconomic factors affecting K-12 public education in North Carolina. Brooks is already giving back by serving as a mentor to freshmen in the Life Sciences First Year program and the College of Sciences’ Office of Diversity and Student Services; a teaching assistant for several courses at NC State; a College of Sciences ambassador, assisting with recruiting and outreach events; and a volunteer with Homework Haven, a volunteer-based organization that provides Southeast Raleigh elementary school students homework support while improving their literacy and math skills. After completing his undergraduate career, Brooks plans to work toward a Ph.D. in developmental and regenerative biology. He hopes to become a professor with dual roles in teaching and research, where he has the opportunity to interact with students and colleagues from a variety of backgrounds.